When Leonora Evelina Piper (née Symonds) was 8 years old, she was out playing in the garden when she was overcome by a sudden and mysterious blow to the side of her head, accompanied by a hiss, which eventually became words and a message. In utter hysterics, the girl bolted for the house, where she told her mother: “Something hit me on the ear and Aunt Sara said she wasn’t dead but with you still.” A few days later a letter arrived. Sara had indeed died—on the same day, and around the same time the little girl had gone into a fit. According to her parents, it wasn’t the only time in her childhood that Piper would show possible psychic predilections. But for the most part, the family set that aside. A daughter who might have the ability to commune with the afterlife isn’t necessarily something you want to advertise to the neighbors. 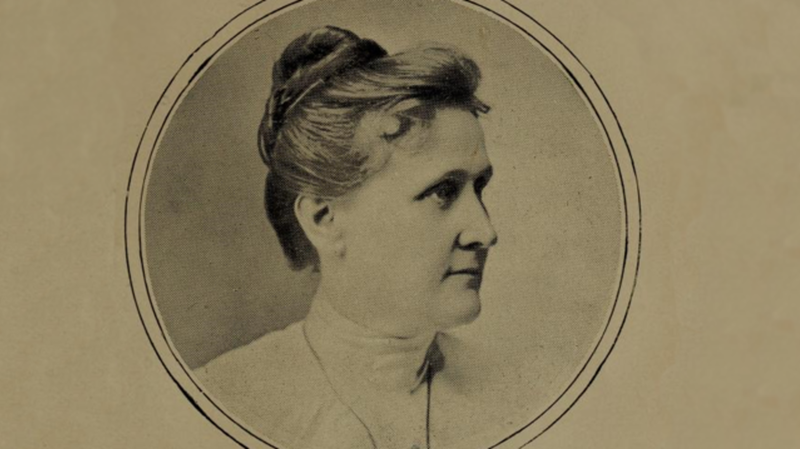 Leonora eventually grew up, married a shopkeeper named William Piper, and moved from New Hampshire to Boston. The pair had a daughter named Alta in 1884, who, despite bringing much joy to the couple, also aggravated a longtime injury in Piper. As a child, Piper had been involved in an ice-sledding accident that led to internal abdominal bleeding. Following Alta’s birth the pain was so bad Piper sought the help of a clairvoyant—an elderly blind man who purported to have the ability to contact healing spirits. When they touched, it ended up being Piper who experienced something otherworldly. The young woman reportedly entered a trance-like state. She became dizzy and said she heard a myriad of voices, one of which came through clearly enough that she was able to write down a message. As soon as she was finished, Piper handed the dispatch to a man who was also at the parlor that day, a local judge, who said it was a message from his deceased son. As Deborah Blum writes in Ghost Hunters: William James and the Search for Scientific Proof of Life After Death, Piper returned to the blind clairvoyant a few more times, but retreated after she found herself becoming the focus of attention. She was pregnant with her second daughter, and said she didn’t want to practice as a medium. Alice, and her husband William James—a Harvard professor, founder of the Society for Psychical Research, and skeptic who helped discredit several popular mediums in Boston—went to see Piper. With little knowledge about the couple or their recent circumstances, she successfully conjured the name of their deceased little boy (or at least James felt she did; the name Piper spoke was Herrin, not Herman). "If you wish to upset the law that all crows are black … it is enough if you prove one single crow to be white. My white crow is Mrs. Piper,” James would later say in his 1896 presidential address to the Society for Psychical Research. Not everyone was so convinced, however, and James himself would later express skepticism of his own. For years Piper held private readings at her home and allowed members from the British and American Societies for Psychical Research (SPR) to attend. She was reportedly completely cooperative when it came to inquiring minds, permitting researchers to frequently sit in on her séances. She was likely the most thoroughly scrutinized medium of her day: SPR members also sent test subjects and even hired private detectives to follow Piper and her husband around to see if they exhibited any behavior that might indicate information-gathering regarding potential clients. Their quests proved fruitless—no sign of fraud was ever found. According to Amy Tanner's 1910 book Studies in Spiritism, Piper charged $20 per séance (about $580 today), enough to help support her family. While in her trances, Piper used so-called “controls”—spirits that spoke through her. “Dr. Phinuit”—a Frenchman—served as the primary control in Piper's early mediumship, but she went on to become a supposed vessel for a number of spirits who would then communicate through voice or automatic writing. She also employed psychometry, a method in which the medium uses material objects to do readings, and was taken on several trips to Britain to demonstrate her supposed abilities there. 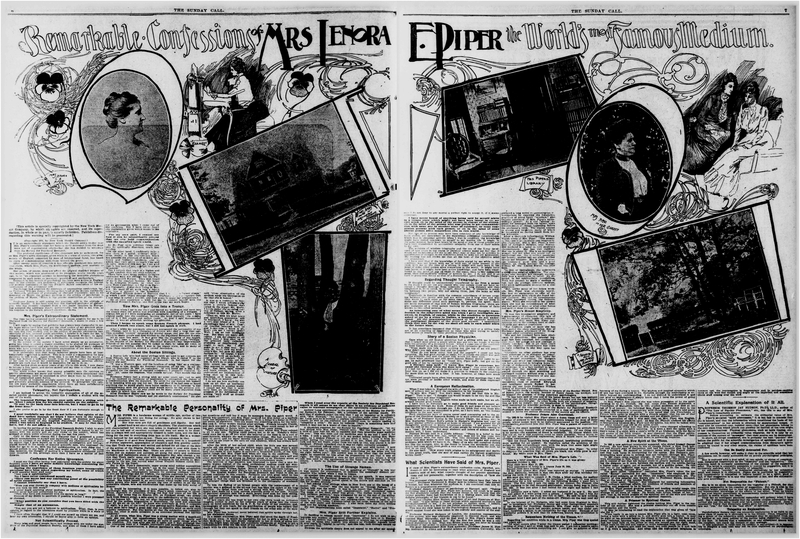 Despite her many believers—she was among the most famous of mediums in the age of Spiritualism—many others called Piper's supposed abilities a hoax, and not even a good one at that. She often failed to provide accurate details about her clients or their dearly departed, and persistent inaccuracies regarding her controls befuddled those who were studying her. (Dr. Phinuit for example, didn’t seem to know much about the French language or medicine, his two defining characteristics.) Another investigator tested Piper by concocting a story of a dead relative named Bessie Beale, and the medium went on to relay messages from the nonexistent spirit. Some said Piper had multiple personalities, others believed her to be savvy mentalist with a knack for cold reading and “fishing,” and others still said she had a talent for surreptitiously learning details about guests before they sat down for a session. Even William James didn’t believe Piper was communicating with ghosts, but rather using telepathy, and drawing on memories and other information from her clients as well as others, perhaps even subliminally. The scholar could find no "independent evidence" to back the possibility of of spirit control. Ultimately, all the press likely only served to fuel the interest in Piper and her clairvoyant services. And while we may never know what she truly believed, it didn’t matter when it came to the business of mediumship: She found fame and fortune in her séances, though she reportedly never sought much attention beyond continuing to meet with sitters and allowing herself to be repeatedly, almost obsessively observed for science. In the early 1900s, Piper's trance abilities reportedly began to fade. She gave her last séance in 1911, and officially retired some years later. She lived to be 93 years old, dying on July 3, 1950 from bronchopneumonia at her home in Brookline, Massachusetts. She is buried at Mount Pleasant Cemetery in Arlington, Massachusetts. History remembers her as a conflicted character—and as William James's one "white crow."